KATHMANDU, Dec 6: National team winger Anjan Bista continued his goal scoring form as his spot kick in the second half helped title contender Manang Marshyangdi Club register a narrow 1-0 win over Jawalakhel Youth Club at Satdobato on Wednesday. 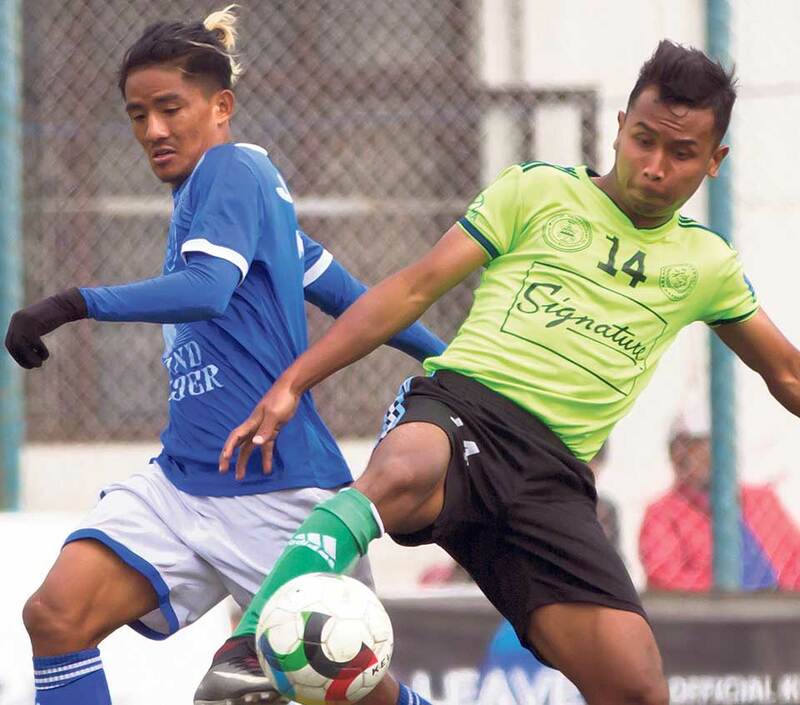 At the All Nepal Football Association (ANFA) Complex in Lalitpur, Manang took its winning run to six consecutive games, from where it sees itself at the top of the table with 18 points from the possible 18 so far. Bista scored from the spot in the 62nd minute after a dull first half. Manang was awarded the penalty after Adama Doumbia produced a very bad tackle at a launching Afeez Olawale inside the box. With the goal, Bista is at the top of the goal-scoring chart with five strikes from six games so far. 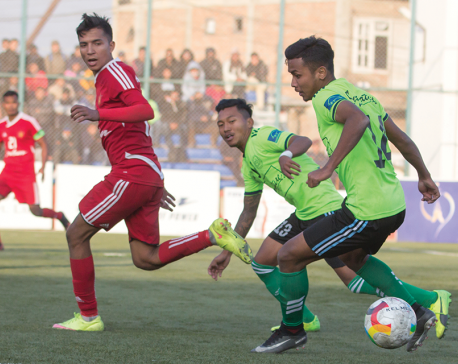 Manang improved its performance in the second half and created some chances, but Jawalakhel keeper Sagar Shrestha did not let any more shot get inside his post. Kamal Shrestha crossed the ball from the right side of the penalty box, but Olawale’s header eight minutes from time went just over the bar. Jawalakhel created some chances near the final whistle, but could not convert them. Sushil Kumar Yadav headed a ball which looked like going in, but keeper Bishal Shrestha made a brilliant save to deny him in injury time. Shrestha got himself injured during that process, and was taken out of the field immediately. Jawalakhel got a chance to score as it was awarded a free-kick from 40 yards out in the injury time. Olaleken Afreez Lawal’s free-kick hit the post and returned back and the team lost a chance to get a point. Thapa for a brilliant performance not letting Manang score more. Jawalakhel head coach Raj Kumar KC said that the game, which he thought was going to be a success, was lost because of the lack of coordination among the players. “We lost the game because of a small mistake. We had set the tactics to play defensive football and hit Manang on counter attack. Some of our tactics worked well, but conceding the penalty was a bad luck,” KC said. Jawalakhel is at the 11th place with four points. In the second game played in Satdobato, Chysal Youth Club came from a goal down to defeat Himalayan Sherpa Club 2-1 to register its second win of the league season. Tridev Gurung had given Himalayan a lead in the 15th minute as he scored the rebound after Karna Limbu’s shot hit the post. Gurung converted the follow-up after Chysal backline left the ball assuming it was offside. Himalayan could not play with the same standard in the second period as it played in the first half. 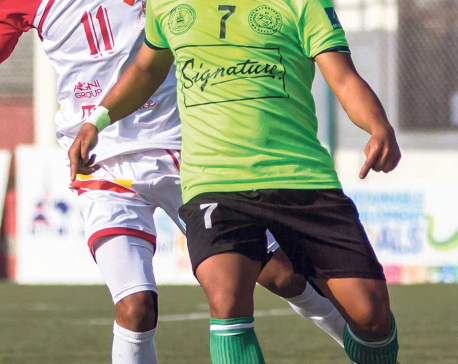 Santosh Sahukhala scored an equalizer for Chysal in the 56th minute, while Niraj Basnet gave his team a winner in the 73rd. Sunil Khadka hit a shot, but the ball struck Basnet and went inside the post for a crucial lead. Chysal got other chances to score as well. Sahukhala’s shot from inside the box was brilliantly saved by Himalayan keeper Kishor Giri in the first minute, while Hemant Thapa Magar’s 30 yards out powerful strike hit the post and went out. With the win, Chysal climbed to the seventh place with seven points, while Himalayan is sixth with 10 points. 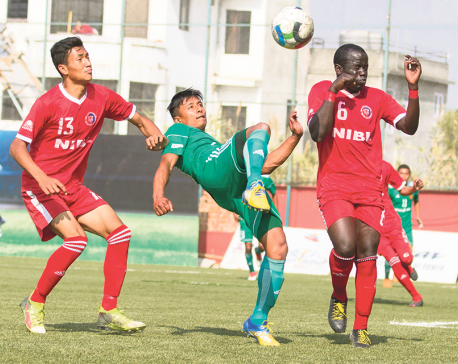 Also, in the match played at the Armed Police Force (APF)’s Halchowk Stadium in Halchowk, Three Star Club has climbed up to the second place with its fifth win beating Saraswati Youth Club 2-1. Three Star has 15 points from six games, while Saraswati is ninth with six points from the same number of games. Three Star also came from a goal down to win the game. Victor Amobi gave a shock third minute lead to Saraswati, while Ranjit Dhimal equalized for Three Star in the 17th minute. The second-placed team needed not work very hard to get the lead as Nirajan Khadka scored the winner in the 36th minute. The second half could not produce any more goals, so the result stayed as it was.